12 MONTHS OF FAIRS, CARNIVALS AND FESTIVITIES TO ENJOY IN COLOMBIA. Colombia for sure, is one of the countries that has more fairs, carnivals and festivities to celebrate all year round in the whole world. It is inherent to the Colombian way of life to be happy and to make a party of almost every occasion. At every city, town or region there are festivities made for the entertainment of locals and visitors. Many excuses are brought to celebrate in community, The majoritie of them, are a heritage that come from many years back in time. In the following lines I will tell you about very important events that happen in my country from January to December during every year. With this information in hand, you will be able to better plan your vacation and your visit to paradise. So let´s get started and be prepared to be amazed by the many events that happen in Colombia from the first month of the year to the last. Here they are, the Top Colombia Tips for “Fairs, Carnivals and Festivities”. Right after the old year ends and the new one begins at the city of Pasto in the department of Nariño, southern region of Colombia in limits with Ecuador, the “Carnaval de Blancos y Negros” (The Whites and Blacks Carnival) takes place every year with an event that calls for racial integration in a very festive way. At the Carnival elaborated floats in a beautiful inauguration parade open the festivities, at the following day there is the “Whites day”, in which everybody is “painted” in white with baby powder or a human safe paint and at the next day is the “Blacks day” in which everyone is “painted” in black with either shoe polish or human safe paint. Music, street theater and many activities are held at the city and at the towns of the Nariño region and the majority of the population celebrates in a very festive way. At Cartagena de Indias, during the first two weeks, arrives the Cartagena Music Festival with the sounds of the classical music. Colonial plazas of the old city and its theaters fill the magical realism ambience with classical masterpieces of worldly renowned composers, and some of the best performers of the actual classical music scene of the planet. The celebration of the new year goes to the coffee zone of Colombia, to the city of Manizales in the department of Caldas where a Spanish heritage tradition takes form as the Feria de Manizales. The Feria also crowns the beauty queen for the International Coffee Pageant which not only elects the queen because of her beauty but also the one that knows more about coffee; the way it grows, forms of preparation and how she will help to promote in the planet the consumption of the beverage that wakes up the world. There are also musical concerts, folkloric expressions and corridas de toros (bullfights). Manizales is a very good plan to have a great time and enjoy the beautiful region known as the Eje Cafetero (Coffee Axis) where you can appreciate the “Coffee Cultural Landscape” a combination of factors that make this area the perfect place to cultivate the best coffee of the world. You may encounter Juan Valdés at the Feria and for sure you will enjoy to the max. “Hay Festival brings readers and writers together to share stories and ideas in sustainable events around the world. The festivals inspire, examine and entertain, inviting participants to imagine the world as it is and as it might be”. In the second month of the year all eyes look to Barranquilla, the capital of the department of Atlántico in the northern coast of Colombia over the Caribbean Sea. At this vibrant and industrious city, the 4th most populated of the country, every year the “Carnaval de Barranquilla” takes on place and makes one heck of a celebration. It is held 4 days before the Ash Wednesday prior to the lent. Most of the years it is held on February, though there are some years that it falls on March. The Carnival has been held since the beginning of the 20th century when Barranquilla began to be a very important port on the Atlantic Sea and the gateway for imports and exports to and from Colombia. Therefore the city became a mix of people between the native barranquilleros and a variety of immigrants from many countries of the world, who contributed to the cultural melting pot that Barranquilla turned to be. At the Carnaval everything is a complete party. The Cumbia, is the music genre that congregates the activities that are held all over the place. The celebration begins on the Saturday with the “Batalla de Flores” (Flowers Battle) where many floats and cumbia dancing groups inaugurate the festivities. Then on Sunday the “Gran Parada de Tradición y Folclor” (Great Parade/Tradition and Folcklore) takes place at the Cumbiodromo and it is here where representatives from many neighborhoods, clubs and cultural organizations dance to the rhythm of the cumbia showing their festive outfits made specially for the occasion. On Saturday and Sunday there comes the Festival de Orquestas (Orchestras Festival) that gives a very well reputed prize in the Caribbean music scene, the “Congo de Oro” and there is every day of the Carnaval, “Baila a la Calle” (Dance to the Street) a free party held on a street with the best cumbia, salsa, merengue, vallenato and Caribbean orchestras of the world. All around the city there are parties for all budgets, from the ones at the top hotels and social clubs, to those ones in the popular neighborhoods of the city all around. On Tuesday the festivities finish with the burial of Joselito Carnaval the figure that represents the eternal party man that goes to rest till next year. 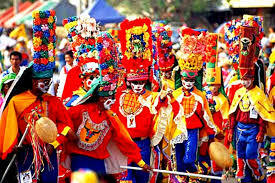 The Carnaval de Barranquilla is how barranquilleros say about it, “Quien lo vive es quien lo goza” (Who lives it is who enjoys it). 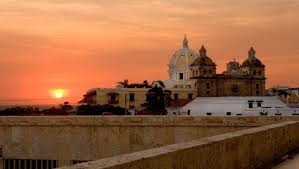 March is the audiovisual and movies month of the year as at, Cartagena de Indias, the Festival Internacional de Cine de Cartagena (International Movie Festival), takes place into the walls of the city. It is a very important festival for the international indy movie scene, as well as for the television industry of Colombia, that produces the famous all over LatinAmerica Colombian novelas, and other television formats. The India Catalina awards are like the Oscars for the movie and TV industry people of Colombia. So therefore, the city gets packed with actresses, actors, directors, producers and obviously movie screenings, concerts, big parties and celebrations all over the place. April is rainy season all around Colombia, but there is no problem for that in the The Land of the Sabrosura. At Bogotá, takes place the Feria del Libro, the Bogotá Book Fair, an important stop for the Hispanic book market industry. It is a very good plan to do if you are at the capital of Colombia. Every year it has a different guest country from all around the planet and many writers and conferences are held as well as concerts, events and parties. Holy week for Christians or Passover for Jewish are celebrated according to the moment when the moon is full by the northern spring equinox. So that happens between the end of March and before the end of April, it changes every year. And Holly week gives way to very important religious celebrations all over Colombia, but we have to highlight two places where the commemoration of the death and resurrection of Jesus Christ, really goes to another level of devotion. Popayán in the department of Cauca and Mompox in the department of Bolívar are two colonial cities that maintain a tradition that comes from the 16th century with emotive processions and total spiritual recollection. In Popayán the commemoration includes the Festival de Música Religiosa (Religious Music Festival) with presentations of classical music and choruses all over the old city churches, plazas and theaters. The city is beautiful and it remains as it was in times of the Spanish Conquista, which gives the perfect scenery to the moment. In Mompox, “Tierra Santa” (Holy Land) as is known, the devotion is recreated as if time had not passed by in this small town built over an island, in the shores of the Magdalena River. The same costumes, processions and customs are recreated year after year as if it was the exact moment when the Spanish built this timeless place on earth. Delicious sweet treats are part of the tradition and neighbors give them away to other neighbors and visitors. They do many kinds of them, always maintaining the original recipes that were handed from generation to generation. In this month is also held at Valledupar, capital of the department of Cesar, the “Festival de la Leyenda Vallenata” (Vallenato Legend Festival) where a king is elected from the best interpreters of the accordion. 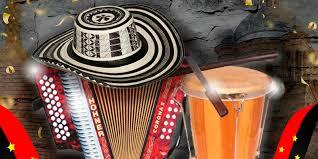 The Vallenato is a Colombian musical genre that is very popular all over the country, it is played with accordion, a small drum called caja and guacharaca that is a slotted board played with a metal rod also a singer, that in the old times was the same accordionist, chants over songs of love or events that happened all around. When it started at the beginning of the 20th century the vallenato interpreters were kind of troubadours that told the news from town to town and went on as music stars do today in their tours. Now Vallenato is the musical genre that is more popular in Colombia. At the Festival the whole city devotes to the rhythm of the music and very important people from Colombia go to the city to enjoy the best performers of this traditional music that has evolved to be known all over Latino and Hispanic musical markets from Argentina to Canada and Spain. Gabriel García Márquez, the awarded literature Nobel Prize recipient was one of the founders of the Festival Vallenato, back in 1968. This is the month of the Mothers in Colombia so there are celebrations and festivities all over the place in honor to the Moms and also to Virgin Mary, as Colombia is a very Catholic country with many Christian traditions. The Andean Colombian Music also celebrates an important event, as the Festival Mono Nuñez is held at Ginebra in the department of Valle del Cauca. At this festival the participants show off their talents in the performing of the typical music of the Colombian mountains. This genres are played with guitar and tiple (12 strings kind of guitar) and the music is really beautiful. At Ginebra, people say they make the best Sancocho de Gallina of the world. The sancocho is a soup made with hen, green plantain, and other ingredients such as potatoes and yucca. If you go there you have to have a sancocho and taste the wonders of Colombian typical gastronomy. At the half of the year all of Colombia celebrates for one or another motive, and folkloric festivals are a perfect excuse to party and have fun to the rhythm of different genres that make part of the country cultural traditions. In Ibague, capital of the department of Tolima, the Festival Folclórico (Folk Festival) takes place as very important representatives of music, dance and another cultural expressions from all parts of the country come to this city to perform and delight the public at this hot city that is known as the music capital of Colombia. 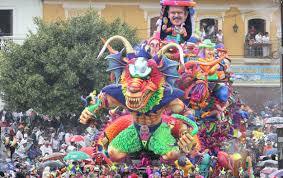 And this is just the beginning, as in Neiva, the capital of the department of Huila another big party takes place. It is the Reinado Nacional del Bambuco (National Bambuco Pageant), Bambuco is another musical genre of Colombia, it is original of the Andean mountains and it is one of the folkloric treasures of the country. The Bambuco queen is elected, not only because of her beauty but as how well she dances the “San Juanero”, a song played with a big brass band. 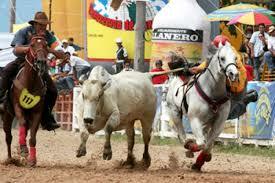 The festivities in Neiva are very good and this is because of how happy is the people from this region. Music concerts, typical food, wonderful events are part of this wonderful festival. At other part of Colombia, the Llanos Orientales, in Villavicencio capital of the department of Meta, the “Festival Internacional del Joropo” (Joropo International Festival) takes place. Here the best performers of Joropo music, another musical genre from this region that Colombia shares with Venezuela, come to this city and show their talent to their fans. There are also many events that exalt the traditions and culture of the region. This is an agricultural stronghold of the country that produces many products for internal market and exportation. And that’s not all as in the northern part of Colombia in San Pelayo, at the department of Cordoba the “Festival del Porro” takes place. This is another musical genre that is derived from the Cumbia. At this event many dancers take the streets as the bands play the traditional music till the morning hours. It is a wonderful experience with festive music and traditional dances that will make you dance as well to the rythm of the porro. The seventh month of the year calls to go to the sea, and is at Santa Marta, capital of the department of Magdalena, where the “Fiestas y Reinado del Mar” (Sea Festivities Beauty pageant) takes place a this touristic city over the Caribbean sea. At this wonderful event many sea oriented activities happen and the queen that besides her beauty has more knowledge of aquatic sports like sailing, skiing and others can take the throne. It is a very nice event with concerts and many things to do in this historical and wonderful city. This is a mongh with many activities to be done as the three major cities of Colombia have massive events that literally move millions of people to dance and to have fun in many ways. In Bogotá, the capital of Colombia, happens the “Festival de Verano” (Summer Festival) a whole set of events that are set up to celebrate the birthday of the city. There are concerts, a half marathon, fireworks shows, a huge orchid exposition, and many activities that change every year. The whole city celebrates and though it doesn’t stops the normal activities you can feel the festive spirit all around. At Medellín, the capital of Antioquia, the “Feria de las Flores” (Flowers Fair) takes place and it makes the city of the eternal spring an even more happy place. There is a contest for the silleteros, that are traditional peasants that make silletas, an artisanal huge bouquet of flowers that they carry on their backs showing their works of art. There are also big concerts and party all around the city as well as many events for the whole family. 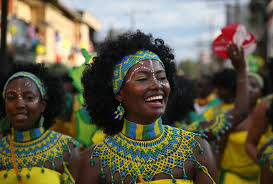 And in Cali, capital of the department of Valle the “Festival Petronio Álvarez” a black heritage music and cultural festival makes the city move to the rhythm of the traditional music of the Pacific coast of Colombia, where many of its population is from African descent. This is a party by itself and during its 3 days people can taste the food and drink the spirits that are made in a traditional way. In September the party moves to Quibdó, the capital of the department of Chocó, where the traditional festivities in honor to the patron of the city, Saint Francis, take place in the famous “Fiestas de San Pacho”. At this festivities the whole city participates of the celebration dancing to the rhythm of the chirimía another music genre of Colombia. The majority of the population of Quibdó is of African descent, so the dances and concerts and happiness are part of the whole party that involves the whole place. The neighborhoods organize in verbenas and dance as one in what they call a “revolú”. The fiestas of San Pacho are a tradition that are part of the world heritage and are for sure one of the happiest of all the country. 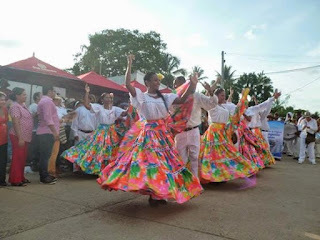 At Bucaramanga, the capital of the department of Santander the celebration is called Feria Bonita (Beautiful Fair) and it has many activities like concerts, artisanal and gastronomical events. Also there is an famed Cattle exposition and fair and agricultural showcase. Happy people in a beautiful city where temperature is always fine. And Jazz has a protagonist role in the month of September as two very important Jazz festivals take place one in Bogotá and the other one at Mompox. Very important performers come to this festivals to enjoy the public with traditional and latin jazz. 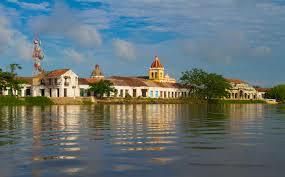 Now the party goes to Villavicencio the capital of the Colombian llanos (plains). This part is an extended green plain that is shared with the neighbor country of Venezuela. At this city the “Encuentro Mundial de Coleo” an international competition of Coleo, a typical llanero sport related to the work on the cattle fields. The contestants mounted on a horse follow a bull that is released to run on a closed pit and grab them by the tail and turn them upside down. Collateral to the tournament there are concerts and many other activities referred to the work in the cattle ranches that are all over the zone. 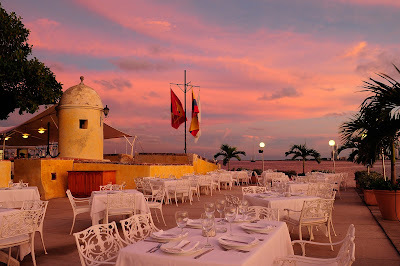 It´s almost the end of the year and Cartagena de Indias turns to be the star of the month. The Independence of Cartagena is the motive to celebrate in the city, the folkloric groups take on the streets and in every neighborhood the sounds of cumbia and champeta make the soundtrack of the fiestas. To complement the festivities every year the Colombia Beauty Pageant is held and the queens of every department participate to be crowned as the most beautiful women of the country for a year. Many events surround the pageant including a floats parade, a boats parade by the bay, many social events and the queens do social campaigns at the poor neighborhoods of the city surroundings. The Miss Colombia gets to represent the country at Miss Universe, contest where is very normal to see Colombian beauty queens at the top spots of the competition to be elected as the most beautiful woman of the universe. In November also, at Bogotá, the sounds of salsa can be enjoyed at “Salsa al Parque” (Salsa to the Park) a free festival with the best performers of this music from all around the Caribbean. 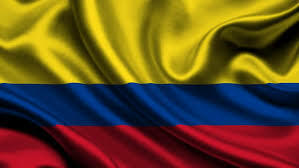 The last month of the year is the happiest of all in Colombia. Here, Christmas is a big family and community celebration and the lightings are a trademark of the season. The cities and towns change the look of the public spaces and turn them into special places full of colors, lights and fun to be admired and enjoyed by locals and visitors. The season starts on the night of the 7th of December and eve of the 8th, when in every corner of the country the “noche de velitas” (night of candles) takes place. This is a tradition that comes from many years ago and it commemorates the immaculate conception of the Virgin Mary. 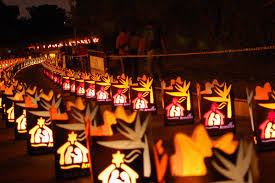 In honor to the Mother of God, Colombians light up candles in front of their houses asking for her favors and celebrating the Christmas time of the year. Wherever you are at the country you will enjoy as the kids do the lighting of the candles and cities turn on the alumbrados (city Christmas lights). You don’t have to Catholic or Christian to celebrate, just be around and the happiness will embrace you. There is a special town where this night is really magical, is a town called Quimbaya in the department of Quindío, in the heart of the coffee zone. At Quimbaya the alumbrados are really special and it is a recommended place to go on this special day. At Tunja, the capital of Boyacá, there is another celebration in the nine days prior to Christmas, is called the “Aguinaldo Boyacense”. There many orchestras and musical groups celebrate the season with concerts and many cultural events. At Cali, just after the 25th the “Feria de Cali” (Cali Fair) takes place and this city usually a happy one, turns happier. Cali is known to be the capital of salsa and the dance schools showcase their talent at the salsodromo, there are also concerts and bullfights that are part of the tradition of the feria. During the days prior to new year the feria is a reminder of why Colombia is one of the happiest countries on earth. 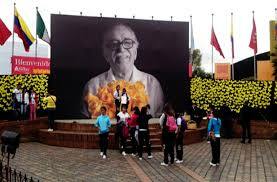 There are many other events in Colombia and I will be talking about them in future posts. Meanwhile enjoy my country that for sure is paradise. Remember that travelling makes you a better person.